My Boots n Me: DeBoville Slough, Port Coquitlam, B.C. DeBoville Slough, Port Coquitlam, B.C. I needed to get out and bond with Mother Nature today. Too much indoor time can drive you a bit stir crazy after a few days. But that's life in Vancouver, you end up going out in the rain, or you don't go out at all. I am still trying to connect all the various dikes and trails in the lower mainland of Vancouver together in my mind. DeBoville Slough empties into the Pitt River. It's part of the Traboulay PoCo Trail, in Port Coquitlam, B.C. Its an urban treasure, with lots of wildlife and some pretty dynamic scenery. I actually like the moody, rainy skies and the threat of rain. It adds some intrigue to photos that would otherwise be the usual scenery shots. I ended up going past the end of the trail and hiking partways up a mountain. With no one else around, I felt I have touched nature again, even in a small, urban way. But the threat of rain was real, so reluctantly, I returned to the land of eagles eyeing the salmon spawning in small streams, ospreys napping in hunchbacked trees, and ducks paddling their days away doing duck things. 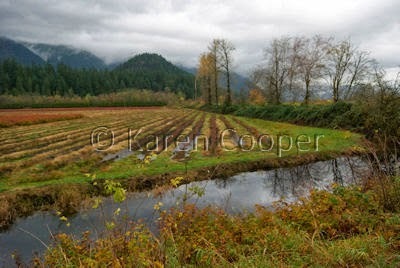 Nice shot, I like the fields and the water and the foggy hills in the back. Nice post! Thanks Susanne. We can't do anything about the weather but try and get some photos around it. Sitting inside is not an option for me. Glad you like the shot.